When I was sixteen I started to regularly write a magazine with news from Vixati, called the Post uit Vixatië (translated: 'Mail from Vixati'). The Post uit Vixatië contained information about diverging subjects, amongst which were politics, art and philosophy and religion. The magazine was issued on an average once every two or four weeks, and was mailed to around ten people I knew were interested. I did the contents, lay-out and copying myself. I wrote the articles on a Commodore 64 Home Computer. I made the last issue (48) of it when I was nineteen. Front of the Post uit Vixatië (translated: 'Mail from Vixati'), number 40, September 1987. For reproduction on this website I cut out the editorial address of the magazine. Only relatively late sometimes pictures and even advertisements started to appear in the Post uit Vixatië. This one is from number 47, June 1988. 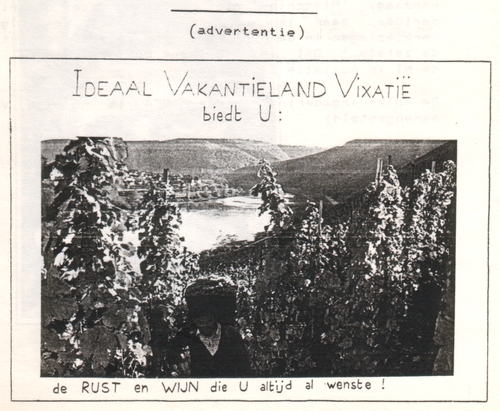 Translated it reads: "The ideal holiday country Vixati offers you: the REST and WINE you have always wished!"